What Style Of Chocolate Pearl Earrings Should You Wear? These days you will find that pearls come in a variety of different shapes, sizes, and colors. One color that is becoming increasingly popular when it comes to pearls is chocolate. So finding the right style of chocolate pearl earrings for you shouldn’t prove difficult. We are here to help you out with expert tips and trick on choosing the right pair style. Keep reading ! Knowing which style suits you best is just as important as knowing which type of pearl earrings you should get. In this article, we aim to take you through a little about how to select a good quality set of earrings that contain chocolate pearls, as well as choosing ones that suit the shape of your face. How To Tell If You Are Getting Good Quality Chocolate Pearl Earrings? Although they are called chocolate pearls, in fact, these are really Tahitian black pearls that have been bleached. As a result, these types of pearls tend to be more expensive than say the white, yellow, silver or rose coloured ones. The thought of wearing a pair of lush chocolate pearl studs sounds delightful, you still need to be careful. If you notice that the pearls in question are very uniform in size, colour, and shape this clearly shows that the pearls have been treated in order for the colour to be achieved. These are expensive but of course not as expensive as the real McCoy. 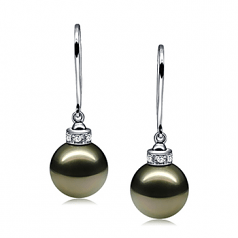 Typically if your pearl earrings contain real chocolate pearls they will have originated from a blacked lipped oyster. This is the very same molluscue from which the original Black Tahitian pearl is also produced. As well as bleaching black Tahitian pearls to turn them a chocolate colour, you may find sometimes that white or cream coloured pearls can be turned this colour as well. In order for this to occur, they will need to be soaked in a standard or chemical dye. Usually, jewelers look to using silver nitrate to turn white or cream pearls into chocolate ones. As a result of this, the cost of such pearls is kept much lower. By using dyes a jeweler can decide just how dark they want them to be. In order to turn a pearl brown so a pair of beautiful chocolate pearl earrings can be created requires them to be soaked in the silver nitrate for a period of time. They then need to be removed and then exposed to light. It is the exposure to light that causes a chemical reaction between the silver nitrate and the pearl causing it to change colour. The longer you leave the pearls in the silver nitrate then the darker they become. One of the best indicators that they earrings you’ve purchased contain dyed pearls is if the description you see is for chocolate freshwater pearl earrings. This is because there aren’t any freshwater chocolate pearls available. Why Choose A Pair Of Earrings Containing Real Chocolate Pearls? You will notice that these types of pearls have a beautiful luster to them. Their reflective properties can range from a soft almost satin kind of feel to something that is more metallic. If you can afford a pair of earrings that do contain genuine chocolate pearls then you have the opportunity to buy a pair in a variety of different colours. Some are more of a gold colour, whilst others tend to be much darker in colour. These seem to match the deep dark colour of a good quality cup of espresso. Although you can wear them at any time you like, these are the kind to be worn when wearing outfits made up of rich autumnal colours. The dark colour of your chocolate brown pearl earrings will bring out the amazing tones of red, gold or green in your outfit. As such earrings are expensive it is important that you know how to take care of such properly. In fact, you should take care of them in the same way you would if you owned any other pearls. To really keep your pearl earrings in top condition there are just a few things you should do. After you have taken them off make sure that you rub them down using a soft damp cloth. Then leave them to dry naturally. 2. You must make sure that you store them properly. So invest in a good soft pouch to place them in. If you do this then you will prevent them from being scratched by other pieces of jewelry that you own. 3. If you look after your chocolate colored pearl earrings they will retain their shine and luster for years to come. Always put them after applying make-up and perfume. So What Style Of Chocolate Pearl Earrings Should You Buy? As we all know the right earrings really help to make an outfit complete, as well as adding a touch of glamour. Generally, the most common kinds of earrings that we women love to wear are studs, drops, chandeliers, and hoops. Whilst they all look amazing, there is a great deal of choice involved in order for you to find the perfect style for you. Below is a quick guide that will help you in choosing the best style for you. If you choose the right style of earrings it will provide that finishing touch to your outfit that will turn something a little ordinary into something very special. What style of chocolate pearl earrings you select will depend on the shape of your face. Well, with our simple guide you will be able to select a pair that really does suit you and makes you look even more fantastic. For those who have an oval shaped face, you are so lucky. As you are someone who is able to wear any style of earrings that you want. Not only will a pair of chocolate pearl stud earrings look fantastic so will a pair of chocolate pearl drop earrings. But might we suggest going for a pair of teardrop earrings. These will create a more balanced look to not just your face but your outfit as well. If you have a round face you may be a little thrown about what kinds of earrings you should be wearing. Ideally looking for a style of earrings that helps to make your face look longer. The best way to achieve this is through wearing a pair of chocolate brown pearl earrings that are thin and long. These are more commonly referred to as danglers. You may also find wearing ones that have a slight teardrop shape suitable. Also, choose earrings that have a geometric or angular design as again they will help to make your face look longer and thinner. For women with a heart-shaped face, you need to wear something that is the opposite to what we’ve suggested for women with a round face. You need to wear a pair of say chocolate freshwater pearl earrings that make your face look wider. So choose earrings that have curves or are elongated. Such earrings won’t only help to balance out your face. They will also help to accentuate your amazing cheekbones and eyes. The most suitable style of earrings to go for are the chandelier kind. Why not select a pair that combines chocolate coloured pearls with off-white or rose coloured pearls. You may even find that wearing a pair of chocolate pearl earrings rose gold chandeliers is perfect. Also this pair of pearl earrings is also indicated . If you have a square shaped face you need to wear earrings that will help to soften the shape of your face. It is best to wear either oversized hoops or ones that dangle from your ears. Wearing such will help to make even the strongest jawline look that little bit softer. Make sure that you don’t buy a pair of chocolate Tahitian pearl earrings that have strong edges to them. These will only accentuate your jawline even more. We also recommend this type of pearl earrings, with a full round shape and a rich chocolate color. If you have a narrow shaped face you need to be wearing earrings that create a sense of width. In fact, a good quality pair of chocolate pearl earrings would be the perfect choice for you. You may also find that choosing a pair of clustered earrings is a great choice, as well, as they hug your earlobes. You should not look at choosing to wear a pair of chandeliers or long thin earrings as they will make your face look even thinner. Plus they will also cause your face to look sharper. For women with a diamond-shaped face then go for long earrings with curves. So choose a pair of long earrings that dangle down. By choosing a pair of curved chocolate pearl earrings you will soften the harsh angular features of your cheekbones and jawline. Although diamond shaped earrings look stunning you should avoid this style. They only help to exaggerate the shape of your face even more. Hopefully, the information that we’ve provided above is going to help you choose the right style of chocolate pearl earrings for you from the amazing selection that we here at Pearls Only have to offer.